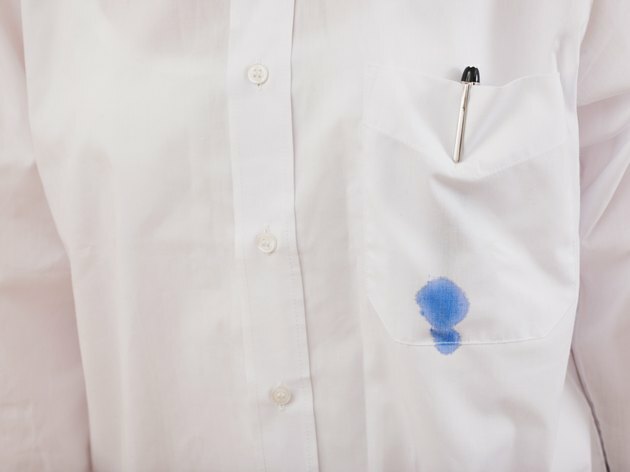 Ink stains are a common problem on clothing, and you often don't discover pen marks on clothes until after you've washed and dried them, making the removal more difficult. However, you can use common household products to get ink stains out of garments. To help prevent ink stains, check your dryer for pen marks on the tub. If you find any, spray the area with hairspray and wipe clean. Wet the ink stain on the garment. Spray hairspray generously on the ink mark. The ink mark should begin to run. Work the hairspray into the stain with your fingers, then rinse. Repeat as necessary. Wash the garment with soap and water, and dry.